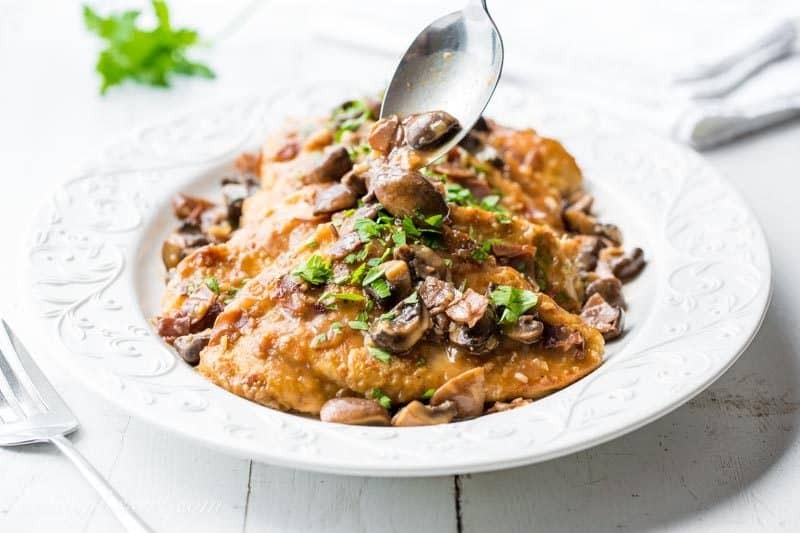 Classic Chicken Marsala ~ tender chicken breasts are seasoned and sautéed, then simmered in a Marsala wine sauce with shallots, prosciutto, and plenty of earthy mushrooms. 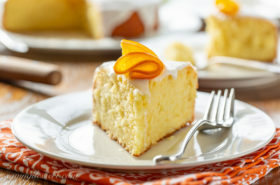 Your guests never have to know how easy this is to make! Chicken Marsala is one of the first dishes I posted on the blog almost 7 years ago. 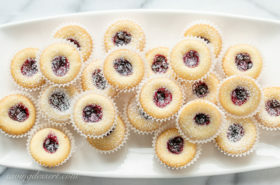 Since then, I’ve made some minor tweaks and updates to the recipe, and of course, took a few new photos. All that to say, it was a good excuse to make this amazing dish again, just for us! (Yeah leftovers!) It’s hard to take photos when company is coming over. Nobody wants to wait when dinner is ready to serve. Chicken Marsala has Italian roots, and is an American favorite in many popular franchise restaurants. Just because you can order this is a restaurant, doesn’t mean you can’t make it at home. 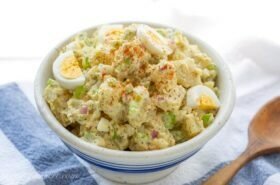 It’s a totally satisfying dish, especially when served with creamy garlic mashed potatoes. I may, or may not have licked my plate clean! Good thing no one was around to see that – haha. Cremini mushrooms are really just brown or tan mushrooms. They’re similar in flavor to a small portobello and are from the same family as the button or white mushroom. When selecting mushrooms make sure they have not bloomed. Turn the mushroom over and look at the bottom of the cap near the stem. It should be closed. This is the mushroom you want. If the gills are exposed when the mushroom is still whole, skip it. This is not true with all mushrooms, but it is with cremini and porchini varieties. Be sure to clean each mushroom removing any dirt or hard woody stems. Don’t soak the mushrooms in water as they will absorb the liquid and become mushy. You want the mushrooms to absorb the sauce in your dish, not the tap water. More often than not, I wash each mushroom with a wet paper towel, knocking off the dirt and wiping it clean. A bit tedious, but worth the effort. Clean each mushroom and drain them well, stem side down. That’s it. For this Chicken Marsala recipe, I removed the tough stems, sliced the small mushrooms in half and the larger ones into fourths. Be sure to flatten your chicken breasts to ensure quick and thorough cooking. I used full size breasts but you can use cutlets if you can find them in your grocery store. A cutlet is just a chicken breast sliced to an even thickness to promote quick cooking. Any extra fat or stray pieces of chicken skin are removed. You can cut your own cutlets from full size breasts, or pound the breast to an even thickness as I have done here. I love how it looks so elegant topped with all those mushrooms and a little chopped parsley. An easy and delicious dish with a pretty presentation. Good enough for a special occasion and easy enough for an anytime meal. 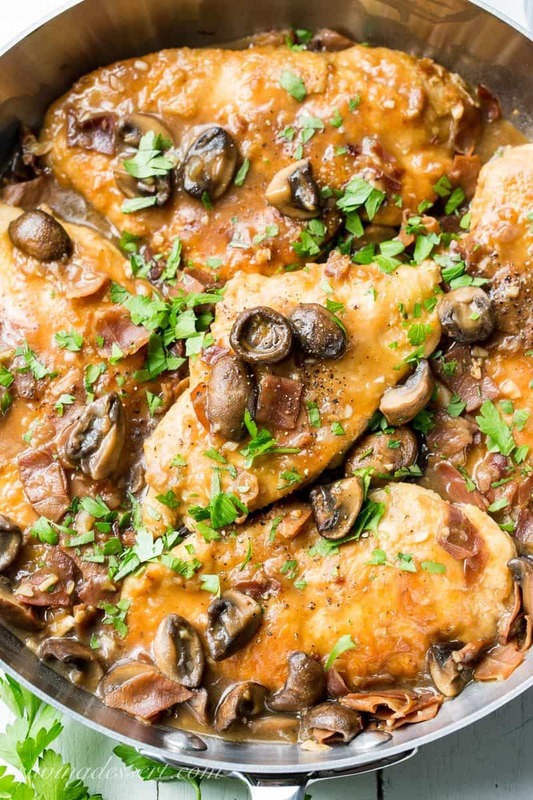 Tender chicken breasts seasoned and sautéed, then simmered in a Marsala wine sauce with shallots, prosciutto, and plenty of earthy mushrooms. Your guests never have to know how easy this is to make! Place the chicken breasts in a large ziplock bag and flatten to 1/2" even thickness. Combine the flour, cornstarch, pepper and salt together in a shallow bowl, pie plate or platter. Set aside. Heat a large non-stick skillet over medium-high heat. Add 3 tablespoons of the olive oil. Once shimmering, dredge the prepared chicken breasts in the flour mixture shaking off any excess. Sauté the chicken in (two or three) batches until golden brown on each side taking care not to crowd the pan. Remove the cooked chicken to a platter or sheet pan in a single layer. Keep warm. Lower the heat under the skillet to medium and add the remaining 1 tablespoon of olive oil. Add the prosciutto and sauté for a minute or two to render some of the fat. Add the shallots and garlic and sauté for about 3 minutes or until the garlic is fragrant and the shallots are softening. Add the mushrooms and cook until their moisture releases, then evaporates. Season with fresh ground black pepper and add the thyme. Add the wine to the pan with the mushrooms and deglaze (scrape up any crunchy bits off the bottom.) Bring to a boil and add the chicken broth. Bring the Marsala sauce to a low simmer and reduce the sauce slightly. Add the butter and stir until melted. Return the chicken breasts to the skillet and simmer for a few minutes or until the chicken is heated and cooked through. Check seasoning and add salt and pepper if needed. Remove to a platter and garnish with parsley to serve. Small brown or tan mushrooms can be substituted for the Cremini. I’ve had a long time love affair with chicken and mushrooms dishes. 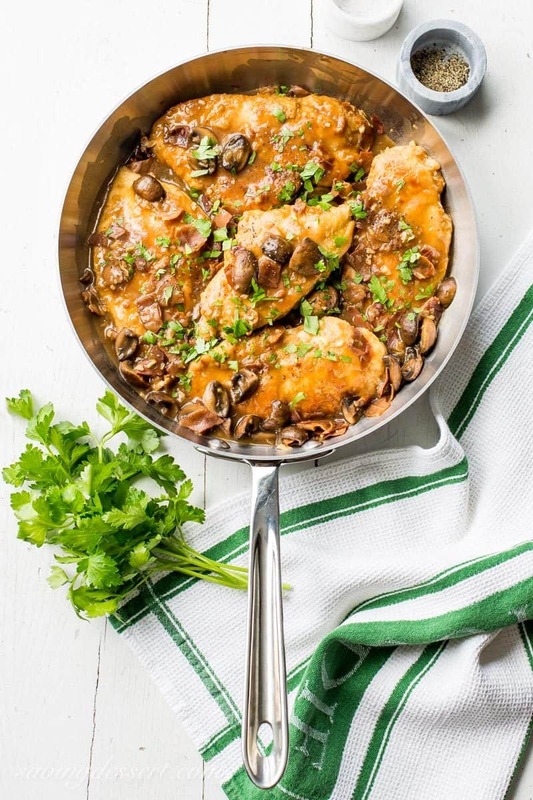 Our Skillet Chicken and Mushroom Wine Sauce is another favorite pan of delicious comfort food. And for the mushroom lovers among us, you’ll want to try our Vegetarian French Dip with Mushroom Jus, and this super popular Wild Rice & Mushroom Soup. We adore this Campanella with Mushroom Sauce for a simple meatless Monday meal, and this absolutely delicious Wild Rice and Mushroom Pilaf. Goodbye August and hello September! Are you ready? I’m a fall person myself, and look forward to cool evenings, fleece jackets and hot tea to warm my bones. But, before we enjoy all things pumpkin, football and falling leaves, we’re heading out on a vacation below the equator where it’s springtime! Our regular followers probably know I often dream of big fat travel adventures and get that itch to see the world. We’re getting ready to head out on another amazing adventure and I can’t wait to share it with you! I hope you’re following me on Instagram because I plan to share our adventure as much as possible. Also, I’ve got some terrific recipes lined up for you while I’m adventuring and hanging out with my traveling husband, enjoying the land down under! Australia here we come! Oooh, I haven’t made chicken Marsala in ages! I’ve never added prosciutto—what a delicious recipe!! Thanks Liz! Such a perfect recipe for any occasion. Have a lovely weekend. I’d love to eat at your house! Looks mouthwatering. I had a “run” of making chicken marsala years and years back (probably was trying to use up the bottle of marsala!) and stopped. I need to try again and see if I can somehow make it somewhere near as delectable as your version! Have a great Labor Day weekend!! I hear you Monica – I’ve had a bottle of Grand Marnier for more than a year so I leaned toward desserts that would be great with a splash. But now it’s gone and I’ve moved on to Apple Brandy – haha. Love Chicken Marsala too! Hope you’ll grab a bottle of wine and whip up a batch soon. Thanks so much! Thanks Anna – I hope you’re having a wonderful trip! Talk to you soon. Thanks Monique! You’re going to love it – we really do. Have a lovely weekend. 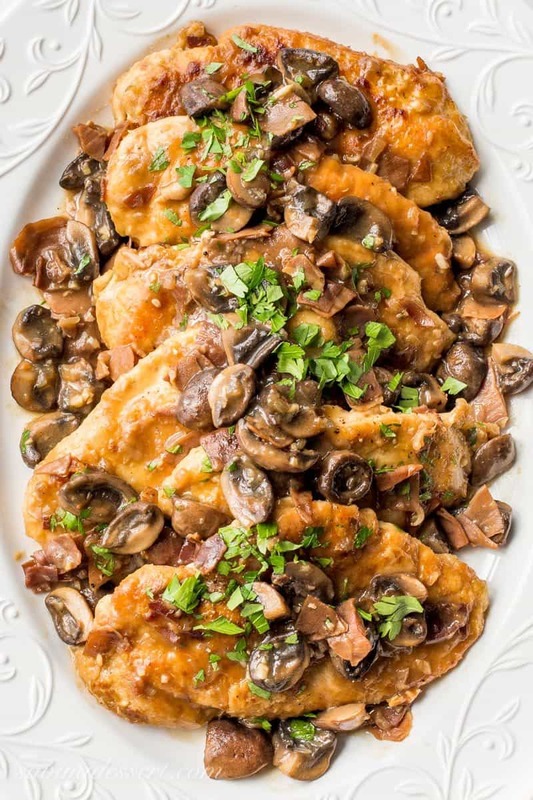 I have a soft spot for chicken Marsala and your recipe looks great. My husband doesn’t like mushrooms either which gives me more mushrooms to eat. Pinned! Thanks Gerlinde – more mushrooms is always something I enjoy 🙂 Thanks for pinning! This is an absolutely beautiful dish! What can I do about a husband that will not eat the mushrooms? Could I leave them out? I really want to make this work. Hi Karen – great question because not everybody loves mushrooms. I know people that are allergic so I think you could substitute eggplant or zucchini in place of the mushrooms. Or, cut the mushrooms in half (instead of quarters) and keep them big enough to pick out easily. Maybe he would eat the chicken as long as he didn’t have mushrooms on his plate. I love the meaty flavor of mushrooms so I think eggplant might be the best substitute. Good luck and I would love to know what you do. I’m sure other readers would be grateful for a substitute too. Chicken Marsala is a favourite around here. Everyone loves it (well, except for the vegetarian 😉 Yours looks perfect and reminded me I need to put it on the menu soon 🙂 Have a wonderful vacation, Tricia. Will be watching for photos! Thanks Jennifer – I bet you make a perfect Chicken Marsala. I’m getting pretty excited about the trip – better go pack! Best chicken Marsala EVER, Tricia. Those pan seared chicken cutlets alone are already very delicious and then the sauce…o my…just fabulous! Thank you, thank you Angie! You made my day 🙂 This is a keeper for sure. Have a lovely weekend. 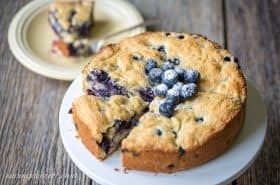 Thanks for this recipe, really enjoyed reading your article on this page, really awesome and sharp pictures. Thank you Jagruti. I find your recipes fascinating and beautiful. Mushrooms are a big deal in our house, we’re always looking for new ways to use them, and this is one of our favorite comforting mushroom meals! Yours looks perfect for entertaining, what a feast! This looks and sounds delicious! Loved the tips for choosing and preparing mushrooms :). Thank you Julia. 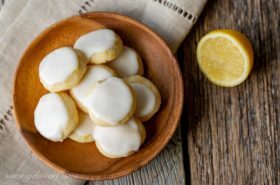 We love this recipe, especially with mashed potatoes – yum! This is a favorite around here and yours looks really, really good so I’ll try it next time around. I’ve been know to like my plate on occasion. Haha – yes indeed! Plate licking is perfectly acceptable behavior around here too. Thanks so much Larry – hope you love it. Can you believe I’ve never had chicken marsala before?! :O The ingredients sound amazing and the finished dish looks wonderful, so I’m sure I’d love it! Thanks Nicola – I bet you would love it. So much flavor and so easy to prepare. Thanks for stopping by! I love family dinners – your mom must be pretty special to do a weekly meal. I do a once a month dinner with 9 people. This is the best recipe for gatherings! Thanks for stopping by! Who doesn’t love Chicken Marsala? Your version is beautiful Tricia. It sounds so easy yet it looks like it would be perfect for a dinner party! Thanks so much Chris. It is a favorite recipe for any occasion. Have a lovely weekend!